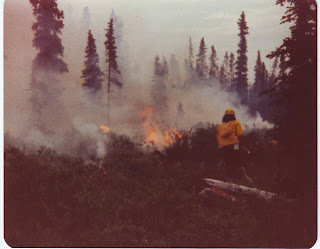 The summer of 1980, I worked on a fire crew in Kenia, Alaska. I'd long since dreamed of seeing Alaska, and working up there while doing so fulfilled that dream and then some. I'd heard all of the stories about mosquitoes, massive wildfires reaching hundreds of thousands of acres...far larger than any fires at that point in time in the contiguous U.S.
What I didn't expect, however, was that fires didn't act the same up there as they did in my prior experiences. Despite raining nearly 5 days a week, fires did break out, and to my amazement, they burned on water-soaked tundra! And once the fire got going, it consumed huge swaths of forest in an amazing amount of time. I discovered this article on firefighting in Alaska, and it answered many of the questions that I didn't know I still had. The Science of Firefighting in Alaska. Wow, does this video ever bring back a distinct memory. We were patrolling a fireline in Flagstaff, Arizona, and the wind changed. We made a mad run out of there with flames licking the sides of our truck! If you love nature and the outdoors, you probably want to believe that the original intent of the U.S. Forest Service when it was formed in the early 1900s was to protect our forests from annihilation by rampant logging. However, that was far from being the case. 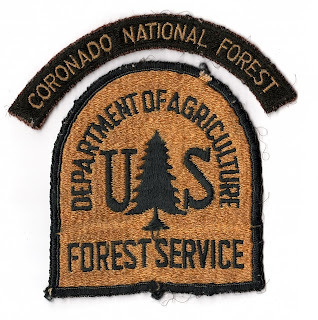 In the 1870s, forest reserves, which was what our national forests were called then, trees were considered resources that needed monitoring in order to extend the harvest, like one would grow a crop of tomatoes. The Federal Government never thought about how someday these forests would be our Nation’s few remaining places where we could connect with nature without worrying about a subdivision springing forth. The Government was more concerned that if they didn’t manage tree harvesting, they would lose revenue. Note the goal to “manage” harvesting. For revenue. The Forest Service is the only government agency that generates revenue by selling off natural resources, including lumber, minerals, and grazing permits for cattle. Where did preservation come in? It didn’t. However, I could go on and on about that, but instead I want to say that I didn’t find it a surprise to read about how severe drought in the early 1900s led to massive wildfires threatening to wipe out all of the West’s “stored lumber,” sending the Forest Service into a panic. “Put out every single fire!” they vowed. Fire was an enemy to be conquered. Total suppression of every single solitary blaze became their goal. 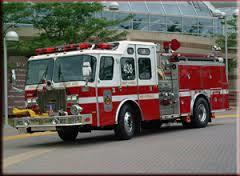 The first firefighters were not permanent or even full time employees. In fact, firefighters weren’t hired until there was a fire. Rather than keep fire crews on call during fire season (expensive for the under-funded agency), officials opted to build fire lookout towers in strategic locations in order to spot fires before they became a big problem. But now to find men who wanted to sit in a “box” on stilts for days on end, looking for smoke. This is where it gets interesting. Men didn’t want to do this, but the Forest Service didn’t have an alternative. They didn’t employ one single woman. Not even in the office. The first woman to break into the all-male agency was Hallie M. Daggett in 1913. She snagged one of those “undesirable” fire lookout jobs on the Klamath National Forest. And what a gal! When the men on her district snickered and laughed behind her back, saying she’d be too scared to last up there in the lonely tower and she’d be on the phone the first night, begging to go home—it served them right when the phone didn’t ring with a call from her—then, or the entire 14 years she’d held the position. Seems to me she was braver than they were by putting up with snide comments and hanging onto the challenging position for years—the one men didn’t want to be bothered with. However, at least one man recognized that these women outdid the men they filled in for—including their husbands, or so said one district ranger. I’ll bet he treated his wife quite well. Think about this: only one woman was hired between 1913 and 1957. 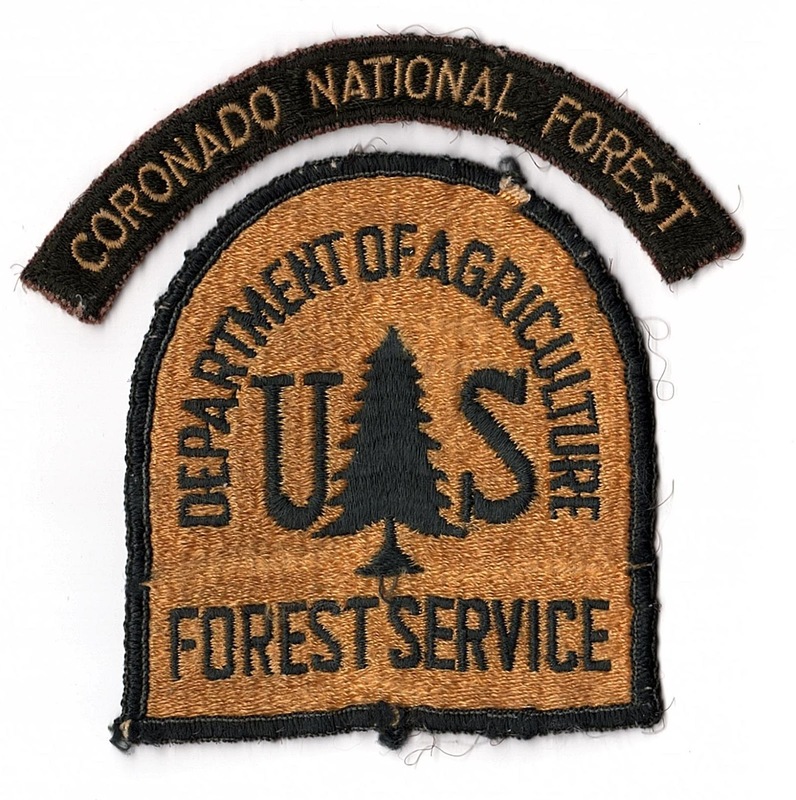 Joanne G. McElfresh became the first woman Forester for the agency. But women in fire suppression other than fire lookouts? Another nineteen years would pass until the agency would allow women on fire crews. Yup, you read that right. Nineteen years. When I tried to research the exact year the Forest Service began hiring women on fire crews, I couldn’t find much. I did land on one accounting that 1975 was the magical year, which made sense, as my first year with the agency was 1976, and I experienced everything I read about women entering this field then. Men had one heck of a time accepting, much less knowing how to deal with, women working by their side. That was exactly what I’d found out, the hard way. My decision to accept a firefighting position had nothing to do with me fulfilling a lifelong dream of being a firefighter. It also had nothing to do with me out to prove that I could do a man’s job. However, that’s what I usually ended up doing. What not only saddens me, but makes me angry, is that it is still happening to women on fire crews to this day. What do you think is the reason? Why do you think men still treat women the same way they did 40 years ago? I'd love to hear your thoughts. A great video I found on YouTube made by the U.S. Forest Service. Sure makes me miss my former occupation!